SINGAPORE (March 29): Asian currencies sagged on Wednesday as solid US economic data backed expectations for Federal Reserve rate hikes this year, giving a lift to US bond yields and the US dollar. Asian currencies had rallied earlier in the week as the US dollar took a hit after US President Donald Trump failed to push through a healthcare reform bill last week, raising doubts about his ability to deliver pro-growth fiscal policies. The gains in Asian currencies have sputtered, however, as the greenback was bolstered by data on Tuesday that showed US consumer confidence hitting a 16-year high and comments from Fed Vice Chairman Stanley Fischer that reinforced expectations of more US rate hikes to come. The Taiwan dollar eased 0.2% and pulled back from a 29-month high of 30.115 per US dollar set on Tuesday. Most other Asian currencies also inched lower, including the Chinese yuan and the Philippine peso. In the wake of the recent gains in Asian currencies, some technical indicators suggest that caution may be needed on their near-term outlook, said Philip Wee, senior currency economist for DBS Bank. "The improvement in the external outlook has helped Asian currencies in the first quarter of 2017, especially... South Korean won, Taiwan dollar and Singapore dollar," Wee said. "Several technical indicators are cautioning me against pushing for more gains here," he added. For example, the US dollar's recent drop against the Singapore dollar stalled near the 200-day moving average, and the greenback may also find support against the Taiwan dollar at the psychologically key 30.000 level, Wee said. If that level is breached, however, analysts say momentum players could step in and sell the US dollar, triggering further gains in the Taiwan dollar. 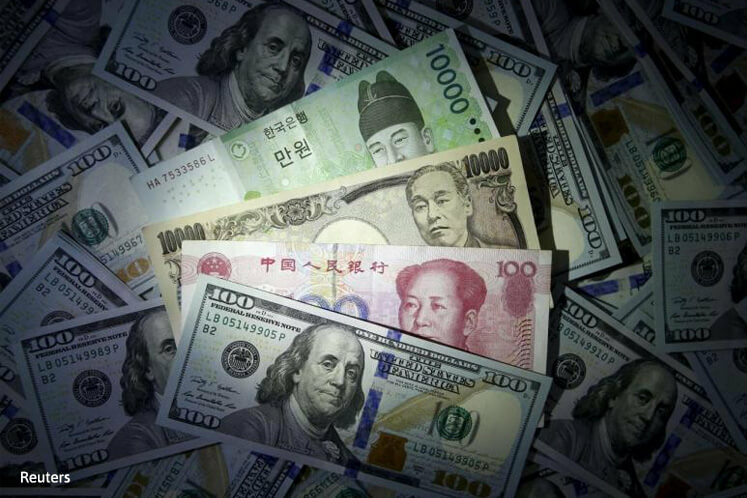 The South Korean won was supported by US dollar-selling by local exporters. The won eased 0.1%, inching away from Tuesday's high of 1,110.5 per US dollar, which was the won's strongest level since Oct. 11. "Though the US economic indicator pointed to a boost in the economy there, most of the market players seem to believe the dollar can turn weaker at any time," said Park Sung-woo, a foreign exchange analyst at NH Futures. Thailand's central bank, facing hurdles to changing monetary policy, on Wednesday will likely keep its benchmark rate where it has been for nearly two years, letting government spending aid the trade-dependent economy. All 24 economists polled by Reuters forecast the Bank of Thailand (BOT)'s one-day repurchase rate will be kept at 1.50% when its monetary policy committee (MPC) meets. The baht was down 0.3% versus the US dollar ahead of the monetary policy decision.